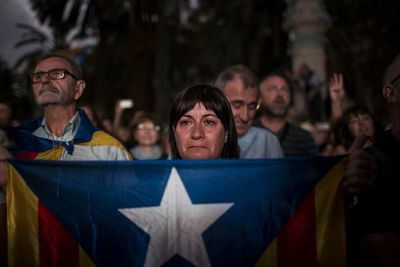 Spain, Barcelona: Pro-independence supporters take part in a rally in Barcelona, Spain, Tuesday, Oct. 10, 2017.Catalan President Puigdemont has proposed to suspend Catalonia's declaration of independence for few weeks to hold talks with Spanish government. 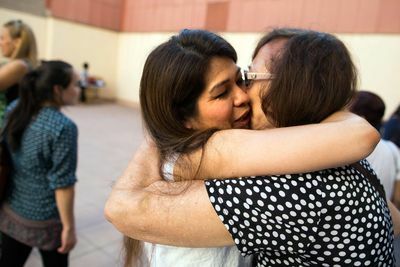 Gilda Arnez (left), 46, from Bolivia, attends a birthday celebration at Latin American Women Association in Barcelona, Spain. Gilda Arnez migrated to Barcelona for economical reasons in 2004. She left three children back in Bolivia and wanted to improve their future while working in Europe and sending them money. However, life in Spain has not been so good as she expected and she has been working in many small jobs, mostly taking care of old and disabled people. Now that she has legal residency in Spain, she would like to bring her children. Gilda Arnez (center), 46, from Bolivia, attends a birthday celebration at Latin American Women Association in Barcelona, Spain. 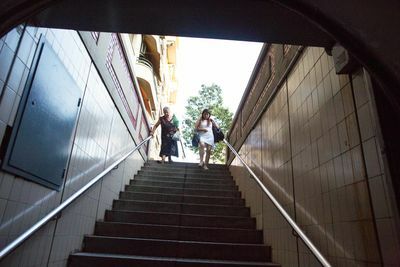 Gilda Arnez (right), 46, from Bolivia, and her friend Graciela (left), walk downstairs to the metro station after attending a birthday celebration at Latin American Women Association in Barcelona, Spain. Gilda Arnez, 46, from Bolivia, travels by metro after attending a birthday celebration at Latin American Women Association in Barcelona, Spain. Gilda Arnez (center), 46, from Bolivia, visits Leonor (left) and her partner Nixon at her house in Barcelona, Spain. Leonor, a 67-year-old woman, used to be taken care by Gilda few years ago. 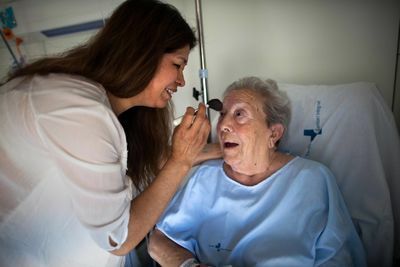 Gilda Arnez (left), 46, from Bolivia, makes up Josefina's face, at Sant Joan Despí Hospital, Barcelona, Spain. Josefina, a 96-year-old woman, used to be taken care by Gilda few years ago. Gilda Arnez migrated to Barcelona for economical reasons in 2004. She left three children back in Bolivia and wanted to improve their future while working in Europe and sending them money. 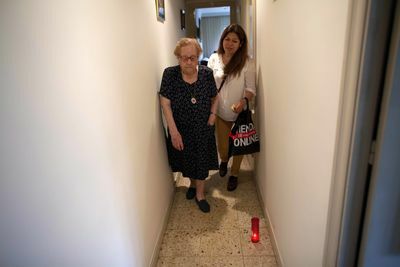 However, life in Spain has not been so good as she expected and she has been working in many small jobs, mostly taking care of elder and disabled people. Now that she has legal residency in Spain, she would like to bring her children. 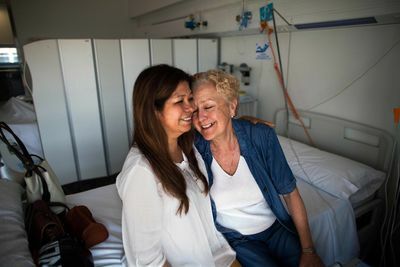 Bolivian national Gilda Arnez (left), 46, visits Fina and others at her former job at Sant Joan Despí­ Hospital, in Barcelona. 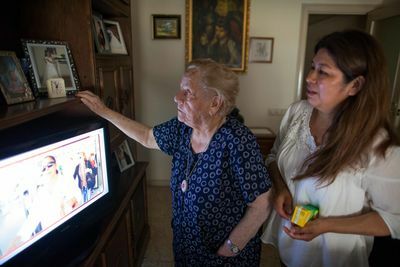 Gilda Arnez (right), 46, from Bolivia, visits Maravillas at her house in Cornellà, Barcelona, Spain. Maravillas, a 90-year-old woman, used to be taken care by Gilda few years ago. 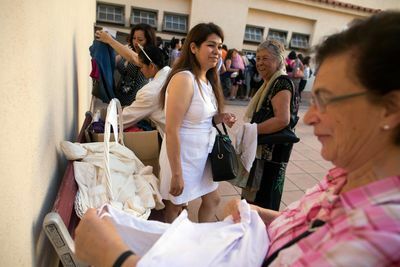 Gilda Arnez (right), 46, from Bolivia, visits Gustavo (center) at Clinica Nuestra Señora de Guadalupe in Esplugues de Llobregat, Barcelona, Spain. Gilda used to be his caregiver few years ago. 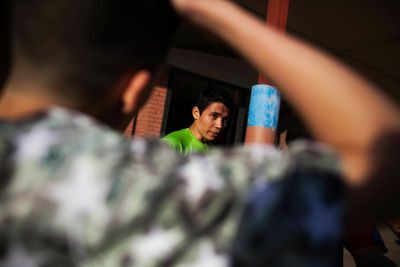 Alejandro Antonio González, 22, from Guatemala, attends a session with his psychologist, provided by the local NGO Exil in Barcelona, Spain. Alejandro arrived in Barcelona in September 2013, after being bullied for his homosexual condition for many years back home: his father repudiated him, police used to harass him and his friends in public areas and he was even once kidnapped and raped by two unknown men. He is happy to be now in Barcelona where he attends a psychologist who helps him feel free to express his sexuality. He actively participates in sexual education campaigns for the gay community and he would like to become a nurse in the future. Alejandro Antonio González (right), 22, from Guatemala, has a drink with one of his best friends in Barcelona, Spain. Alejandro arrived in Barcelona in September 2013, after being bullied for his homosexual condition for many years back home: his father repudiated him, police used to harass him and his friends in public areas and he was even once kidnapped and raped by two unknown men. He is happy to be now in Barcelona where he attends a psychologist who helps him to feel free to express his sexuality, he actively participates in sexual education campaigns for the gay community and he would like to become a nurse in the future. Alejandro Antonio González (center), 22, from Guatemala, walks in Barcelona city center, Spain, with two of his best friends. Alejandro arrived in Barcelona in September 2013, after being bullied for his homosexual condition for many years back home: his father repudiated him, police used to harass him and his friends in public areas and he was even once kidnapped and raped by two unknown men. He is happy to be now in Barcelona where he attends a psychologist who helps him feel free to express his sexuality, he actively participates in sexual education campaigns for the gay community and he would like to become a nurse in the future. 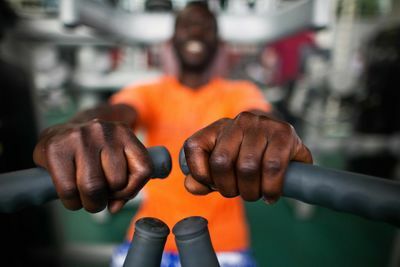 'Fodoy', from Gambia, changes his clothes in a gym in Barcelona, Spain. 'Fodoy' is a nickname for this migrant from Gambia, who arrived to Barcelona in 2007 without residence permit. He fled the country due to political prosecution and departed in a boat to the Canary Islands. Then, the Spanish authorities transferred him to Valencia and then to Barcelona. His asylum request has been blocked until 2017 due to having been condemned for drugs dealing. Until then, he is struggling to find accommodation and to have income to survive, although organizations such as CCAR assist him from time to time. 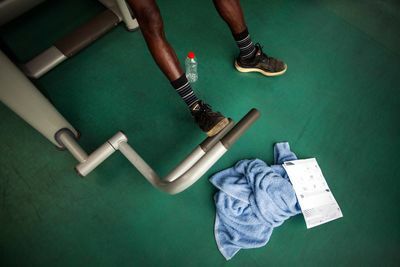 'Fodoy', from Gambia, practices weights in a gym in Barcelona, Spain. 'Fodoy' is a nickname for this migrant from Gambia, who arrived to Barcelona in 2007 without residence permit. He fled the country due to political prosecution and departed in a boat to the Canary Islands. Then, the Spanish authorities transferred him to Valencia and then to Barcelona. His asylum request has been blocked until 2017 due to having been condemned for drugs dealing. 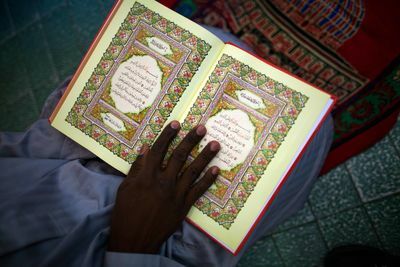 Until then, he is struggling to find accommodation and to have income to survive, although organizations such as CCAR assist him from time to time. 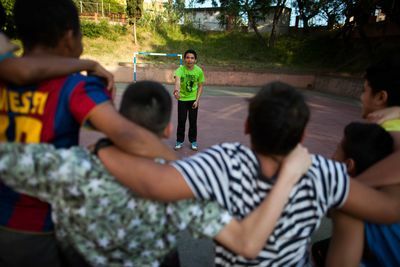 German Acevedo (in green T-shirt) trains a group of young teenagers at risk of social exclusion in Santa Coloma de Gramenet, Barcelona, Spain. 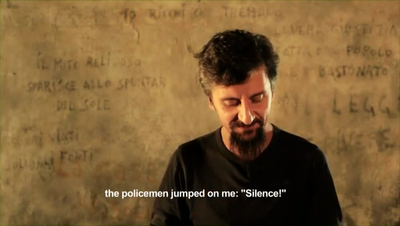 German arrived to Europe in summer 2012, running away from the gangs ("pandilleros") in San Salvador. 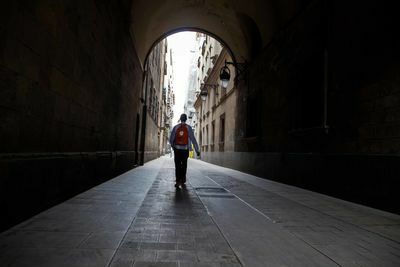 The Spanish Government rejected his asylum request, but he is remaining in the country and attending courses to become a social worker in the future. He does not want to go back to El Salvador because he is afraid of being killed by the gangs. 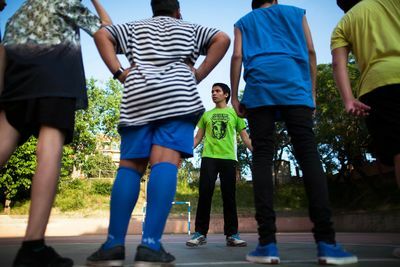 German Acevedo (green T-shirt) trains a group of young teenagers at risk of social exclusion in Santa Coloma de Gramenet, Barcelona, Spain. Yaya Ouahara (center) attends a workshop at the office of the Catalan Commission for Refugee Aid (CCAR) in Barcelona, with two other migrants and two CCAR staff members. Yaya, 36 years old from Ivory Coast, arrived to Spain in 2009 by a small boat and after three years traveling through Africa. Yaya fled the civil war in his country and he recently got residence permit to stay in Spain permanently. 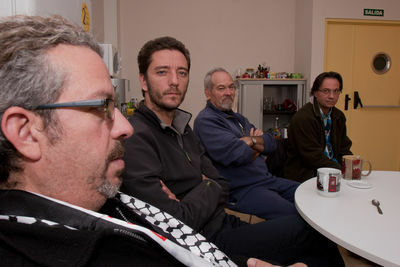 Yaya Ouahara (left) attends a workshop at the office of the Catalan Commission for Refugee Aid (CCAR) in Barcelona, with two other migrants and two CCAR staff members. Yaya, 36, from Ivory Coast, arrived in Spain in 2009 by a small boat and after three years traveling through Africa. Yaya fled the civil war in his country and he recently got residence permit to stay in Spain permanently. 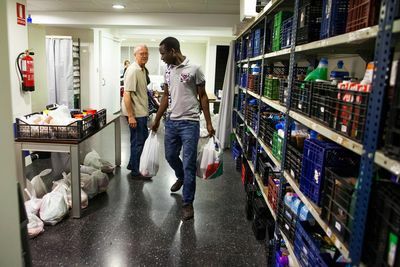 Yaya Ouahara (right) collects food distributed by the local NGO Bona Voluntat en Accio, in Barcelona, as part of the food support program to help migrants and people at risk of exclusion. Yaya, 36, from Ivory Coast, arrived to Spain in 2009 by a small boat and after three years traveling through Africa. Yaya fled the civil war in his country and he recently got residence permit to stay in Spain permanently. Yaya, 36 years old from Ivory Coast, arrived in Spain in 2009 by a small boat and after three years traveling through Africa. Yaya fled the civil war in his country and he recently got residence permit to stay in Spain permanently. Yaya Ouahara arrives at home, in Barcelona, which he shares with two other males from Ivory Coast and Morocco. 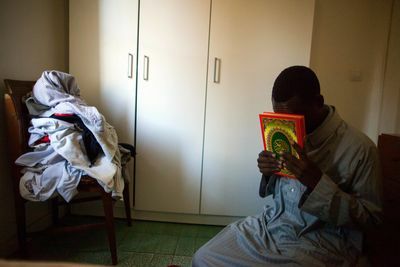 Yaya Ouahara, who is Muslim, prays in the bedroom of his apartment, in Barcelona, which he shares with two other males from Ivory Coast and Morocco. 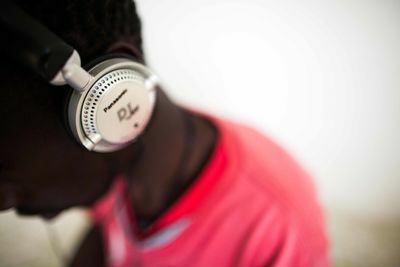 'Fodoy' listens music in his bedroom at the apartment that he shares with other three migrants from Gambia and Kenya in Sabadell, Spain. 'Fodoy' is a nickname for a migrant from Gambia, who arrived to Barcelona in 2007 without residence permit. He fled the country due to political prosecution and departed in a boat to Canary Islands. Then, the Spanish authorities reallocated him to Valencia and then to Barcelona. His asylum request has been blocked until 2017 due to having been condemned for drugs dealing. Until then, he is struggling to find accommodation and to have income to survive, although organizations such as CCAR assist him from time to time. 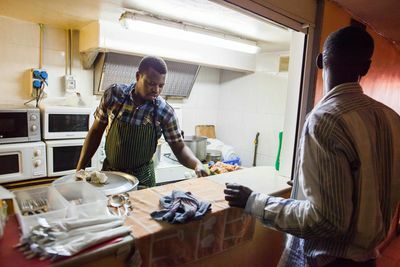 'Fodoy' (right) orders food to the cook of Foni Restaurant, a business in Raval area, Barcelona, specialized in Gambian food. 'Fodoy' is a nickname for this migrant from Gambia, who arrived to Barcelona in 2007 without residence permit. He fled the country due to political prosecution and departed in a boat to Canary Islands. Then, the Spanish authorities reallocated him to Valencia and then to Barcelona. His asylum request has been blocked until 2017 due to having been condemned for drugs dealing. Until then, he is struggling to find accommodation and to have income to survive, although organizations such as CCAR assist him from time to time. 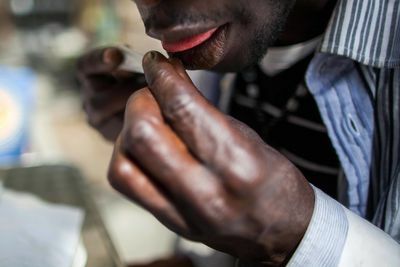 'Fodoy' rolls a cigarette after lunch in Foni Restaurant, located in Raval area, Barcelona, run by Gambian cooks and specialized in Gambian food. 'Fodoy' is a nickname for this migrant from Gambia, who arrived to Barcelona in 2007 without residence permit. He fled the country due to political prosecution and departed in a boat to Canary Islands. Then, the Spanish authorities reallocated him to Valencia and then to Barcelona. His asylum request has been blocked until 2017 due to having been condemned for drugs dealing. Until then, he is struggling to find accommodation and to have income to survive, although organizations such as CCAR assist him from time to time. 'Fodoy' is a nickname for this migrant from Gambia, who arrived to Barcelona in 2007 without residence permit. He fled the country due to political prosecution and departed in a boat to Canary Islands. Then, the Spanish authorities reallocated him to Valencia and then to Barcelona. His asylum request has been blocked until 2017 due to having been condemned for drugs dealing. Until then, he is struggling to find accommodation and to have income to survive, although organizations such as CCAR assist him from time to time. 'Fodoy' rests in Ciutadilla parc, in Barcelona. 'Fodoy' is a nickname for this migrant from Gambia, who arrived to Barcelona in 2007 without residence permit. He fled the country due to political prosecution and departed in a boat to Canary Islands. Then, the Spanish authorities reallocated him to Valencia and then to Barcelona. His asylum request has been blocked until 2017 due to having been condemned for drugs dealing. Until then, he is struggling to find accommodation and to have income to survive, although organizations such as CCAR assist him from time to time. 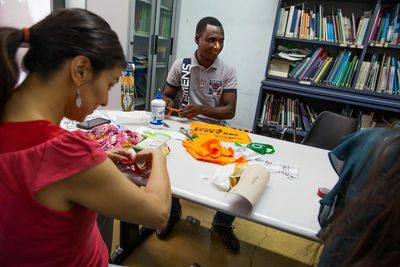 'Fodoy', from Gambia, attends practicals lessons of sewing by the owner (left) of a workshop in Barcelona, Spain. He has experience as a tailor back in his country and he wants to develop his skills. 'Fodoy' is a nickname for this migrant from Gambia, who arrived to Barcelona in 2007 without residence permit. He fled the country due to political prosecution and departed in a boat to Canary Islands. Then, the Spanish authorities reallocated him to Valencia and then to Barcelona. His asylum request has been blocked until 2017 due to having been condemned for drugs dealing. 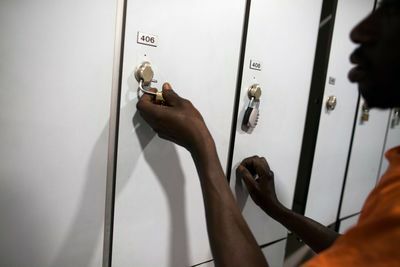 Until then, he is struggling to find accommodation and to have income to survive, although organizations such as CCAR assist him from time to time. 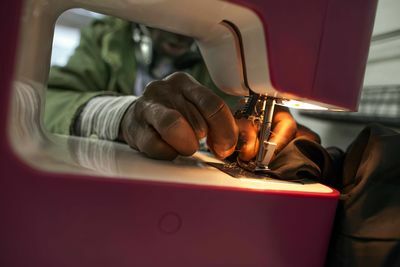 'Fodoy', from Gambia, attends practicals lessons of sewing in a workshop in Barcelona, Spain. He has experience as a tailor back in his country and he wants to develop his skills. 'Fodoy' is a nickname for this migrant from Gambia, who arrived to Barcelona in 2007 without residence permit. He fled the country due to political prosecution and departed in a boat to Canary Islands. Then, the Spanish authorities reallocated him to Valencia and then to Barcelona. His asylum request has been blocked until 2017 due to having been condemned for drugs dealing. 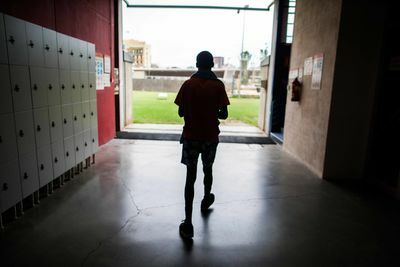 Until then, he is struggling to find accommodation and to have income to survive, although organizations such as CCAR assist him from time to time. German Acevedo (second from right), 23 years old, from La Paz province, El Salvador, participates in an activity from a course to get the certificate on Leisure Director in Escola Lliure El Sol in Drassanes, Barcelona, Spain. German arrived to Europe in the summer of 2012, running away from the gangs ("pandilleros") in San Salvador. 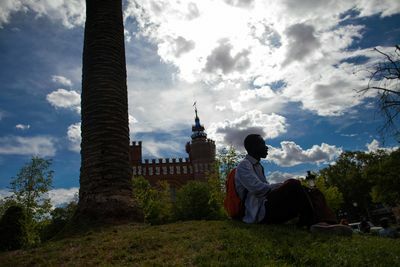 The Spanish government rejected his asylum request, but he is remaining in the country and attending courses to become a social worker in the future. He does not want to go back to El Salvador because he is afraid of being killed by the gangs. German Acevedo, center), 23, from La Paz province, El Salvador, participates in an activity for a course to get the certificate on Leisure Director in Escola Lliure El Sol in Drassanes, Barcelona, Spain. German arrived to Europe in summer 2012, running away from the gangs ("pandilleros") in San Salvador. The Spanish government rejected his asylum request, but he is remaining in the country and attending courses to becomes a social worker in the future. He does not want to go back to El Salvador because he is afraid of being killed by the gangs. Shooting and editing sample media.